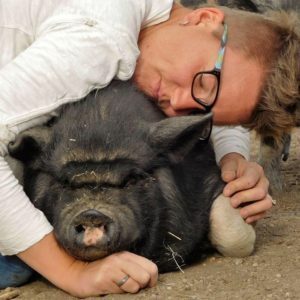 Part of the problem with uneducated pig owners is understanding proper diet for these wonderful creatures. 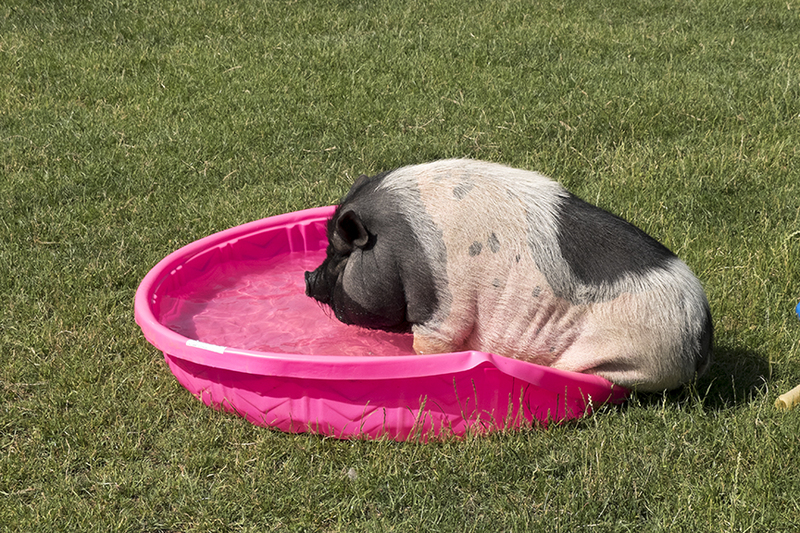 Just because a pig will eat just about anything does not mean feeding them anything is a good idea! 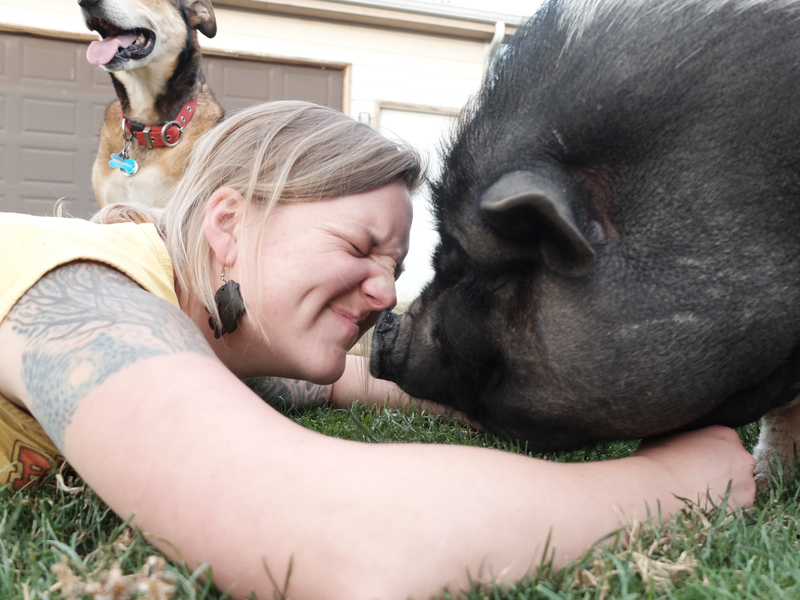 Lucy was on a diet of dog food, pizza, bread, and leftovers from her human owners–but she was loved by them. When her size became unmanageable, we were called to pick her up. Knowing that her obesity needed to be managed, and that she needed to lose a fair amount of weight to be spayed, Andrew and Erin decided she would be a permanent resident–the bond that would form in the amount of time needed to get her healthy would be too strong to break by rehoming her. So how did we work with Lucy’s weight and diet? Erin decided to mix her pig chow with warm water, making it a mash, and mix chunks of fresh watermelon in the food. 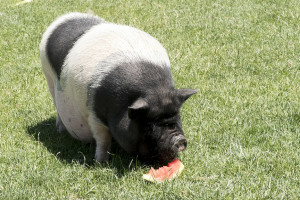 Initially, Lucy would pick out the watermelon, then flip the mash out of the bowl on the ground. In cases like Lucy’s, persistence and patience is critical. We wanted her to be healthy, and did not want to continue bad food habits, so her food was always mixed with fruit for the first few weeks. It took only a few weeks of this routine before she was eating the pig chow and we could eliminate the fruit content. 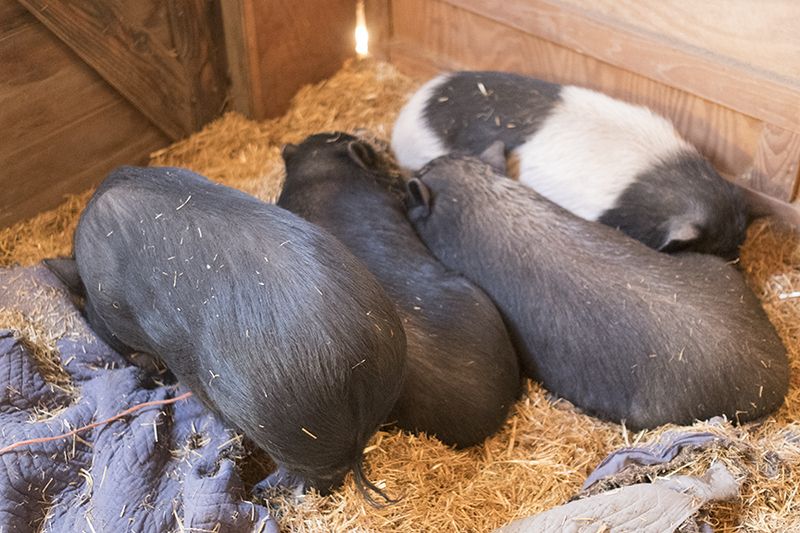 Then, slowly watching the other pigs, Lucy became interested in carrots, cucumbers, and other veggies. 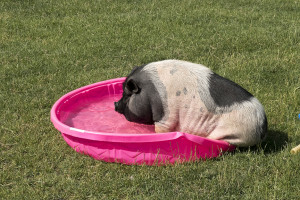 After a couple of months, Lucy was on the right track for a balanced piggy diet. Fast forward a year and 5 months, Lucy is doing quite well. 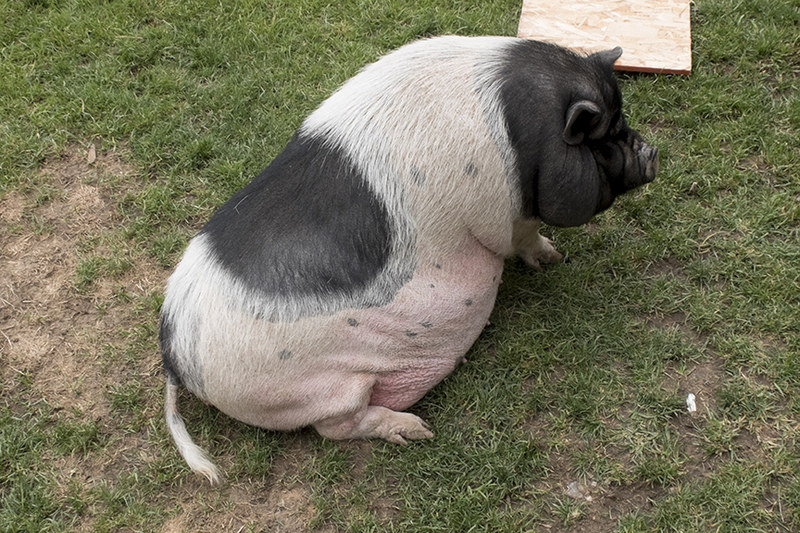 She lost enough weight–roughly 50lbs–to be spayed in January 2016. 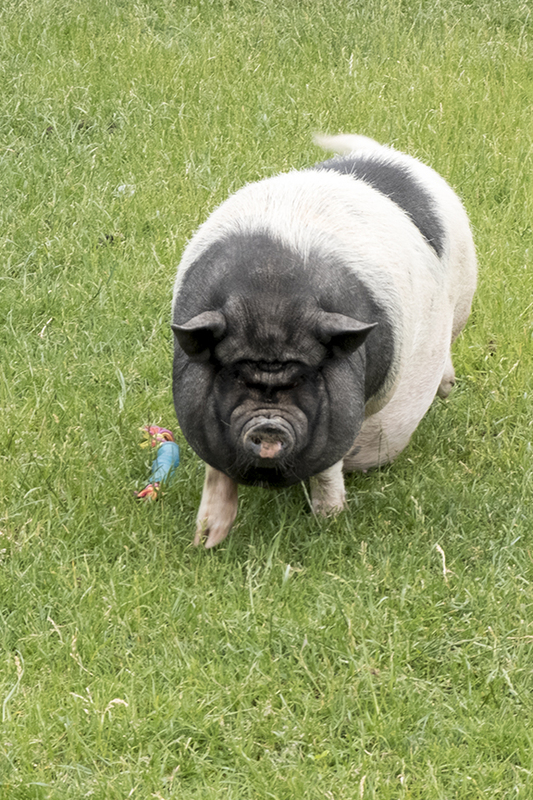 She hustles around our large property, and enjoys snuggle time with her best friends Penelope, Cupid, and Lotus. She is one of the first pigs to greet visitors to the rescue, and has blossomed into a happy, healthier pig. 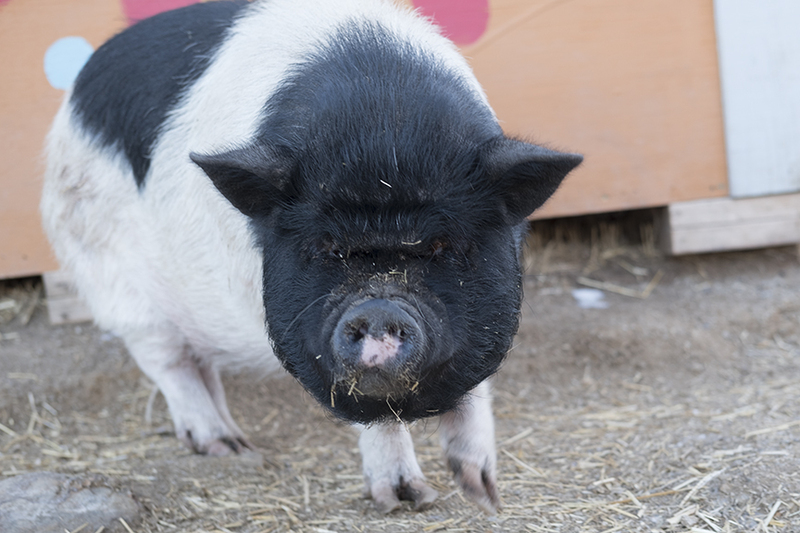 Lucy has been our most frequently sponsored pigs; as of January 2017, she has 3 different people sponsoring her, which helps provide for the care of all of our pigs. Now that she is at a healthier, manageable weight, Lucy moves around faster and is more active than she was in 2015 at her time of rescue. She could still stand to lose a few pounds, but her progress in a year and a half is incredible, and we know she must be feeling much better! Next > Piggies in need of a forever home!